As we can see from the previous part of this series, you can define a set of menu items in your custom callout. These items are called actions. 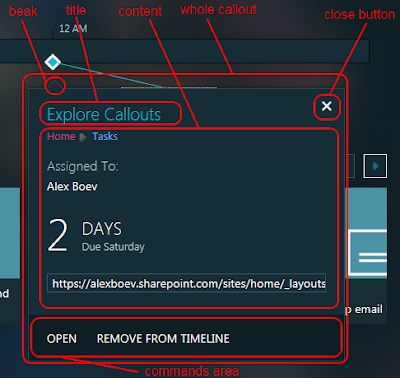 Action creation options are being configured via CalloutActionOptions object. Here we’ve defined the required minimum of options – the text and the click event handler. The text is required option. It’s a string. In addition to the required options for the action you can configure some additional but not required details. 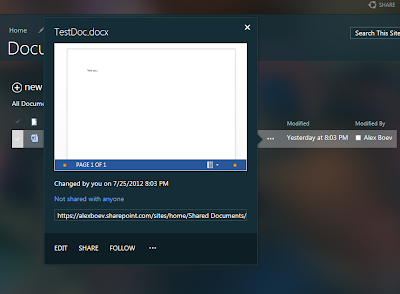 It defines the standard browser tooltip for the action which shows on the mouse over. It’s the tooltip for the disabled state – it allows providing the information concerning the inaccessibility of your option. If the isEnabledCallback function is not defined the action will be always available. The availability is being evaluated on each opening of the callout. The last but not least option for the action configuration is the menuEntries property of the CalloutActionOptions object. It helps to define a special kind of the action – the one with the dropdown menu of options instead of a simple text. 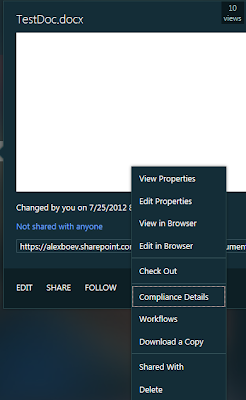 It allows combining several actions in the related and compact groups in order to save space, providing some logical structure for the actions list and adhering to the SharePoint Metro UI design principles. 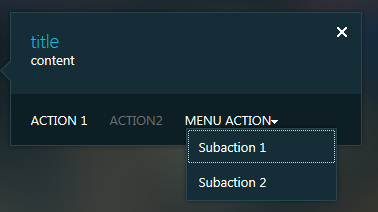 If there are any items in the menuEntries, the action becomes a dropdown menu. In that case you can’t set the action’s onClickCallback handler because the action no more responsible for any real work and only expands its dropdown menu on click event. The minimal parameters for each action menu entry are the text and the onClickCallback function. It’s not practical anyway but if you don’t provide them the whole action will not be shown and the error will be raised. It’s the text of the menu entry. The common design is to have a single menu at the end of the row but there are no restrictions on the menu position and quantity of menus inside the actions row. You can create multiple menus but I think it doesn’t adhere to the SharePoint Metro UI design. There are some questions that need to be resolved still. The CalloutActionMenuEntry class accepts four additional parameters: image url, image alt text, “sequence” and “description”. They all results in some HTML markup inside the generated menu item but it is unclear how they are used. For example, if you provide the image url correspondinf image will be rendered in menu item HTML but will be hidden. It appears that the separators generation is implemented outside the “core” callouts UI framework. Can it be reused?